After the supposed discovery of Verizon's iPhone 5 being GSM unlocked, confirmations of this fact have been echoing across the web. In fact, iDownloadBlog's Jeff Benjamin confirmed it himself. Meanwhile, Cnet coaxed an official confirmation from Verizon, stating their latest Apple handset is indeed "GSM unlocked". Not to be confused with jailbreaking, unlocked phones are simply absent of carrier exclusivity restrictions. When a phone is purchased under contract, it is typically locked to that carrier. This makes certain that subscribers will be forced to use [insert your favorite carrier here] for as long as they intend to use that phone. There have been ways to work around this though, including third-party tools and even officially sanctioned methods, but such measures have sometimes been dangerous, unreliable or ultimately just a pain. I can confirm that the Verizon iPhone 5 is indeed GSM unlocked. Even though I bought an iPhone 5 from Verizon under contract, I was able to cut down my AT&T Micro SIM, and use it in my Verizon iPhone 5 to pick up an AT&T signal. By doing so, I was able to hop onto AT&T’s HPSA+ network, or "4G" as they so ridiculously name it. Incidentally, T-Mobile launched its "Unlimited & Unlocked" campaign, encouraging users to bring in their unlocked iPhones and save big per month. While contract termination fees likely offset the cost benefits, the advertisements are certainly timely. 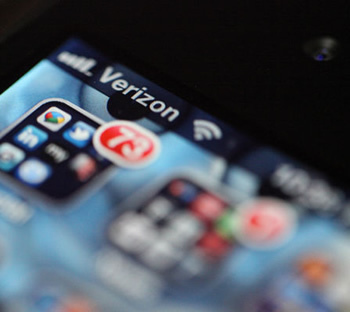 Despite this interesting development, potential customers may want to think very carefully before they take the two-year plunge with Verizon. Scoring an unlocked iPhone 5 may sound sweet, but as The Verge points out, a similar anomaly appeared with Sprint's iPhone 4S last year. Unfortunately for Sprint users, a subsequent update permanently eventually locked those phones to Sprint's network, resolving the company's apparent snafu. It is very possible that Verizon may choose to do the same in the future. Update: Verizon Wireless spokeswoman Brenda Raney has said that Verizon does not plan to relock the iPhone 5 with a future update.